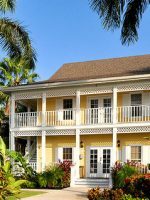 The best vacation properties make you feel like a pampered V.I.P., and at the end of our stay at the Caribbean Club in Grand Cayman, we felt spoiled. Returning to normal life was a drag. 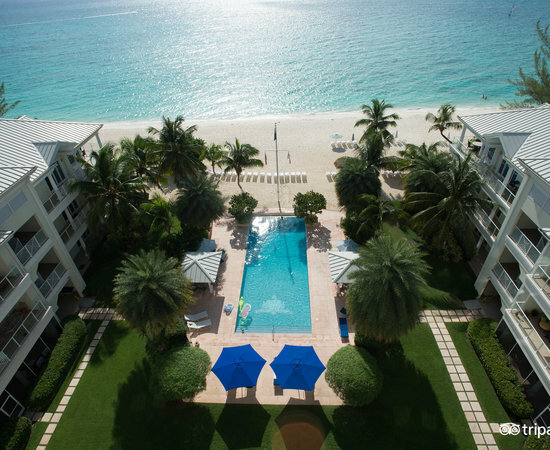 The resort’s allure begins with its location on world-famous Seven Mile Beach. 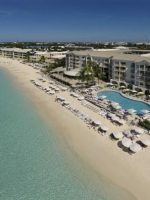 But what truly sets it apart from other Grand Cayman resorts is its intimate atmosphere, with 37 independently owned units that combine the conveniences of home — fully equipped kitchens, washers and dryers and free Wi-Fi — with many hotel amenities, including daily housekeeping, turndown service, an outdoor swimming pool, fitness center and onsite restaurant. The beyond-spacious, three- and four-bedroom units are professionally decorated with glamour and sophistication in mind. The attention to detail includes top brands — Kohler faucets, Wusthof knives and Liz Claiborne bedroom furniture. Though our room was delightfully deluxe, I was only able to relax because my youngest, 6 years old at the time of our visit, knew how to behave among finer things. I wouldn’t have been entirely comfortable here when she was a more destructive 2-year-old. The units are categorized as Pavilion Villas (side wings) or Tower Villas (main wing). All units are accessible via stairs or elevator. Most villas sleep six people and offer the same format: one master bedroom with a king bed, a second bedroom with a queen bed, and a third bedroom with two twin beds. There are two four-bedroom units that sleep eight guests and have two master bedrooms with a king bed in each. All villas are enhanced by high-end extra touches like 330-count bed linens, plush robes, slippers and Gilchrist & Soames toiletries, as well as private balconies or patios from which to take in partial or full ocean views. 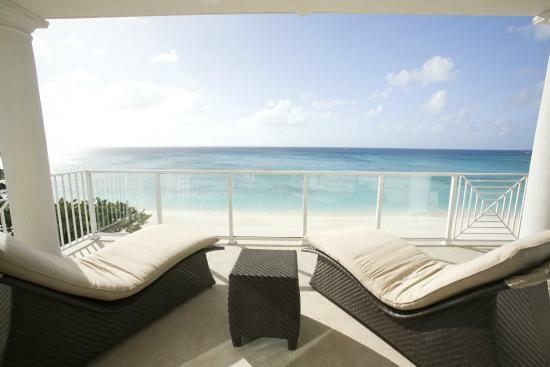 Tip: Book the Beachfront Villas for the best views. Cribs and rollaway beds are available; cribs are $25 per night, and rollaway beds are $15. All units also consist of front-loading washers and dryers, a great room with a kitchen overlooking a large dining room and a lovely seating area. 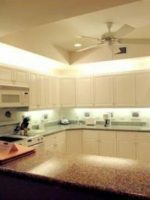 The fully equipped kitchen is a treat to use, and includes granite countertops, a double oven and stove top, a refrigerator with an icemaker, a microwave, dishwasher, trash compactor, and countertop appliances, including a coffeemaker and espresso machine; complimentary espresso packets are provided. You'll find full sets of dishes, glassware, pots, pans, cutlery and cooking utensils, as well. Special services, available for an additional charge, include a personal chef or catering. Turndown service with chocolates is a welcome treat! The main living area and all three bedrooms have 32- or 42-inch flat-screen televisions. Cable service comes from Miami, and includes the Disney Channel, Tooncast, and PBS. A selection of DVDs is also available to borrow from the front desk. The only thing the units lack are enough convenient outlets. We'd love to see more outlets by the bedsides or tables. We fell in love with this place a year ago and made reservations to come back before we even left the hotel! Our return visit was just as good. Huge rooms, great ocean views. Large kitchen, grocery store and liquor store across the street. Lots of restaurants within walking distance. My only small complaint is that the gym is really small. You can make it work but it would be nicer if it was larger with a bit more equipment. Service is fantastic. We had an absolutely amazing stay at the Caribbean Club. 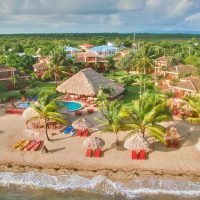 Traveling with 5 young adults and teens could have been a stressful time but our accommodations were the perfect spot for each and every one of us making our week at the Caribbean Club a dream. The condo was immaculate and well stocked; the beach was clean and the attendants were the best from Shorty to Pino and Ricardo. The staff at the Caribbean Club goes above and beyond to answer all needs. We thank Andy, Jimmy, Jaime and Elena. Our stay was made extra special by being made to feel special. The location is ideal for grocery shopping and many of the best restaurants are within walking distance. We would not hesitate to stay the Caribbean Club again! 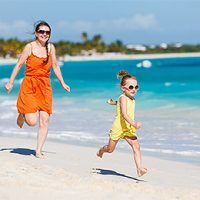 While there are no organized children's programs at the Caribbean Club, most families will be quite content spending their time on the beach or in the pool. The waters of the Caribbean Sea are relatively calm around Grand Cayman because reefs encircle it, acting as wave breakers. We were able to walk out four or five feet before the sea floor dropped into deep water. 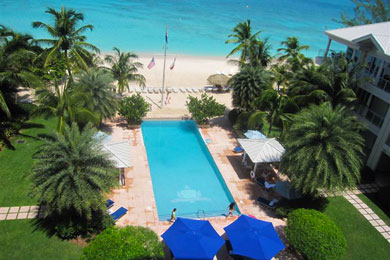 The pool features a striking infinity edge bordering the beach at the deep end, which is six feet. The shallow end is a little over 3.5 feet, with a stepped entrance. Surrounding the pool are cushioned lounge chairs, two gazebos and several umbrellas for shade. 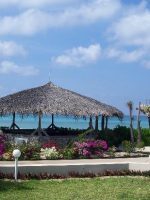 There are also several thatch-roofed cabanas on the beach with built-in shelves. The pool is open from 6 a.m. to 11 p.m. Not only are beach towels provided at the front desk, but an array of complimentary beach toys and rafts are also available. There are no lifeguards on duty at the pool or on the beach. A few paddleboards are available for rent and can easily be charged to your room. The Caribbean Club concierge service is happy to make arrangements for any local activities or attractions, particularly waterborne entertainment, like SCUBA diving, boat rides, kayak rentals, glass-bottom boat tours, submarine cruises or fishing excursions. There is one air-conditioned onsite restaurant, LUCA, serving lunch and dinner. This restaurant is open to the public, too, and is well-known for its Italian cuisine, extensive wine list and upscale atmosphere. 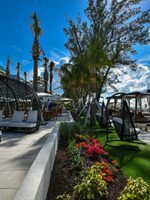 It's also known for its Sunday brunch, an especially popular tradition on Grand Cayman. Make no mistake, though; LUCA is very family-friendly, with a kids' menu and highchairs. The restaurant also caters to those who are gluten-free. Both indoor and outdoor seating (overlooking the pool) are available. 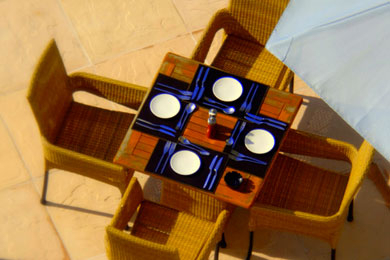 LUCA also provides food and drink service by the pool, at the beach or in your suite/villa. Options include burgers, sandwiches, salads, milkshakes and smoothies. 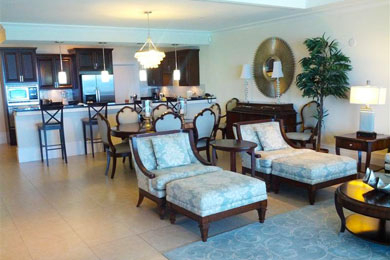 Wi-Fi is complimentary throughout the property, including the beach. Check-in time is 3 p.m., with check-out at 11 a.m.
Outside babysitting services can be arranged through the concierge. You can also utilize the concierge to make tour arrangements, find out where to rent bicycles or water sports equipment, or ask for dining recommendations. There is underground parking, a welcome benefit that keeps your car cool. There is a fitness center in the main tower, and personal training services can be arranged. The gym is open between 6 a.m. and 10 p.m. daily. The concierge can also help you locate and make reservations at local spas and yoga centers. You can request that your kitchen be stocked to your specifications when you arrive. You provide a supermarket list with specific brands and items, and the staff will shop for you. You will pay an additional 20 percent above the price of the groceries. You can also do your own shopping; Foster's Food Fair, an IGA franchise, is located across the street. Note: All island stores, including grocery stores, are closed on Sundays. 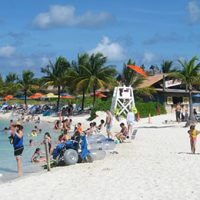 High season in the Cayman Islands is December through March, and the rates reflect the demand for the ideal weather during that time of year. During the low season, from June to November, the prices are lower, and the crowds are lighter. On the other hand, it is both hurricane and rainy season in the Caribbean, which means a high likelihood of afternoon showers. Regardless of the time of year, rates will include a 13 percent government tax and a 10 percent service charge. The Caribbean Club is a 10- to 15-minute drive from Owen Roberts International Airport, which is served by major international and U.S. airlines. It is located on West Bay Road, which is the main thoroughfare, so it can be subject to traffic delays. Airport transportation can be arranged via the Caribbean Club. The most convenient way to get around the island, though, is via a rental car. This maximizes your stay, allowing you to get off the property to go to the supermarket, restaurants and local attractions. Driving is on the left, but depending on the company, you may get an American car with the driving wheel on the left, too. If you choose not to rent a car, the property will send someone to pick you up and retrieve your luggage.